But it is a Crime Stoppers posting! Toronto Police are looking to the public for help in identifying a man found unconscious this week in Toronto Sauna. 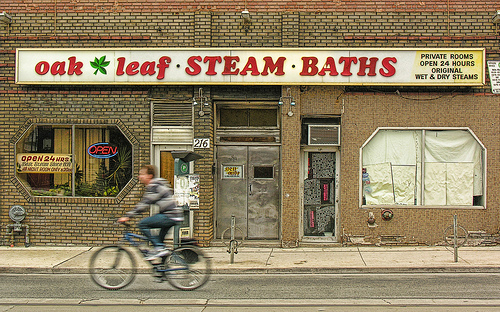 The man was discovered at the Oak Leaf Steam Bath at 216 Bathurst Street on Tuesday afternoon. He is described as white, 6 feet tall’, between 160-170 lbs., around 45-50 years of age, with salt/pepper hair, a beard and few or no teeth. He has a Chinese symbol tattooed on his right forearm, meaning doctor or medicine. He also has an old tracheotomy scar at the base of his throat and a circular scar on his lower-left abdomen. Anyone with information is asked to contact police or Crime Stoppers.